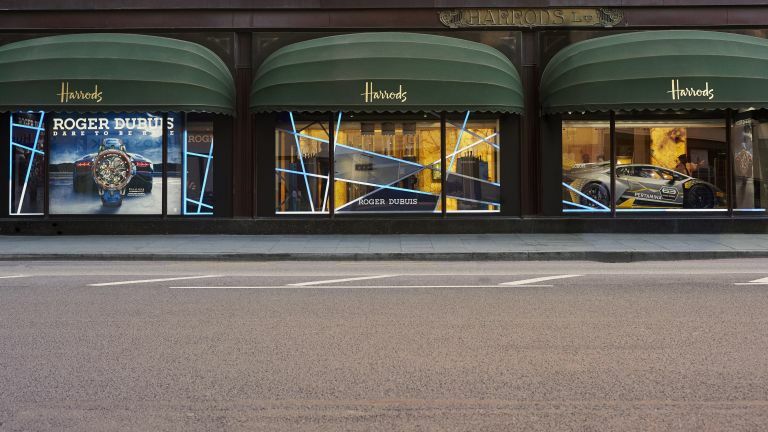 Roger Dubuis has opened a pop-up experience in Harrods to give visitors a chance to discover both the brand's watches, as well as the brand's motorsport universe. The display includes recently launched Excalibur timepieces, as well as the race-ready Lamborghini Huracán Evo, and even includes a driving simulator and lap-time leaderboard, if you fancy yourself as the next Lewis Hamilton. Haven't hear of Roger Dubuis before? It's a relatively new watch brand that has been at the forefront of contemporary Haute Horlogerie since 1995. Its known for bold and extravagant pieces, but with the finest watchmaking mechanisms at their heart. If you decide to visit the pop-up, you'll be able to check out the Excalibur Aventador S watch models, developed in collaboration with Lamborghini Squadra Corse. These watches are an example of highly complicated watchmaking, with the Excalibur Aventador S is crafted from the same C-SMC carbon as that used on Lamborghini’s cars, and driven by a powerful ‘engine’ resembling Lamborghini’s Aventador. The display will include the recently launched Excalibur Aventador S Blue and Excalibur Aventador S Pink Gold, the newest additions to the stunning line up. Some of the watches include straps made from Formula 1 race winning tyres. Alongside the watches, you can also admire the Lamborghini Huracán Evo, which is part of the legendary Lamborghini Squadra Corse racing fleet, famous for its extreme performances. In addition, the Roger Dubuis pop-up features a Roger Dubuis lounge, a unique 3D Sound Experience where guests can immerse into the fast paced world of Roger Dubuis and Lamborghini Squadra Corse using racing design codes, and a Holographic Tower to bring the Roger Dubuis world to life. The pop-up is open from the 2nd July to the 28th July, and can be found at Door 9.